Thank you syaoranmew for sending the e-mail to DelRey and sharing their reply! Such sad and unfortunate news =/ after being delayed over and over again, it was cancelled in the end. Not surprising, but still very sad. The release date of Del Rey’s CLAMP in America guidebook has been postponed to February 22, 2011. The book was previously scheduled for September 28 of this year. No further information was given about the postponement. 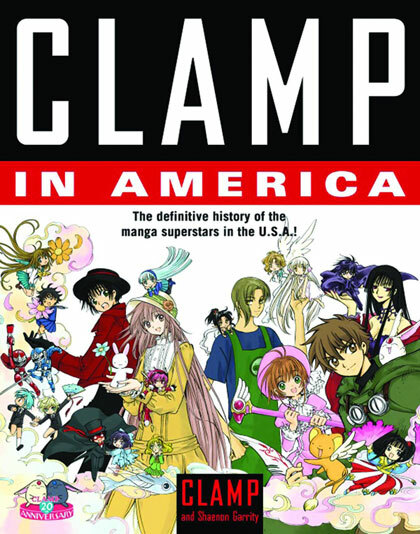 CLAMP in America was first announced in 2008 and it was originally set for a June/2009 release. Since then the release was delayed several times. According to Del Rey, past delays were due to new material being provided by CLAMP. The book’s page count also suffered changes over the time, it was originally announced to have 144 pages, then 336 pages, 384 and now 352 pages is the latest counting. You can read an excerpt from the first chapter via Amazon. Here is the cover of CLAMP IN AMERICA, the guide book which claims to be “the definitive history of the manga superstarts in the U.S.A.”. Good choice for the cover illustration, but I was expecting a new illustration. The colors look a bit twisted, but maybe it’s the picture, and the cover design overall looks ordinary to me. According to the publisher Del Rey, the book will be released in March 2010, costing $27.99. Dark Horse has announced today at this year’s San Diego Comic-Con that the company is currently in negotiations with Universal studios to produce a live action movie adaptation of CLOVER. However, no deal has been signed yet as the two companies are still discussing it. The news come from ANN. On March 2008 I mentioned here the deal between Dark Horse and Universal, and since then I’ve been wondering if the deal would be responsible for making the first Hollywood adaptation of a CLAMP manga. By that time, however, Carl Horn was asked about Mangettes being adapted into a movie. This news left me very happy and very excited! 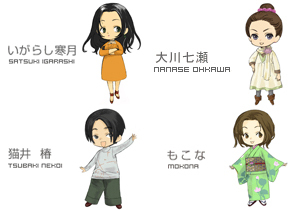 I hope the project does see the light and I hope CLAMP will have their involvement. I can totally see Oscars nominations too (okay, one thing at a time, one thing at a time xD). I will keep you updated about this exciting possibility, definitely! On other news, specially for American people, Dark Horse has hinted that it will be publishing CLAMP Mokona Okimono Kimono in the United States in the near future by displaying the book’s cover in its booth at Comic-Con. No official announcement has been given yet, though. It would be very cool to have an english version of the book! Several online stores such as Amazon have been listing the release date of CLAMP IN AMERICA to February 23, 2010. The official website of publisher Del Rey confirms the postponement for such date. Although no official word has been given, one of the reasons for the change could be due to the increase of page numbers. The book, that covers CLAMP’s career during its 20 years of history and their impact in the American culture, was originally expected to have 144 pages. Now, it is being listed as having 336 pages (more than the double). The price has been increased as well by extent, from US$ 19.99 to US$24.99. There are new CLAMP SDs on CLAMP-PLA.NET ! Takuya Matsushita, who works at the rights departments at Kodansha and is directly responsible for the Tsubasa & XXXHOLiC OADs project, has updated his column and he reveals that the after-recording (dubbing) sessions of XXXHOLiC Shunmuki #1 has been completed. The first public screening will happen on January 25 at Tokyo Disney’s Cinema Ikspiari. Also, several online stores are stating that the release date of CLAMP IN AMERICA guidebook has been pushed to October 20. Quite bad, we’ll have to wait a bit more to read it, but that’s okay if that means time for improvements.